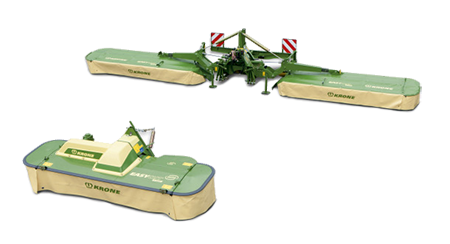 The EasyCut B (Butterfly) provides optimum working widths with its telescopic arms when combined with a Krone ECF (Front mower). The balancing arms distributes ground pressure uniformly to both ends for the perfect cut. 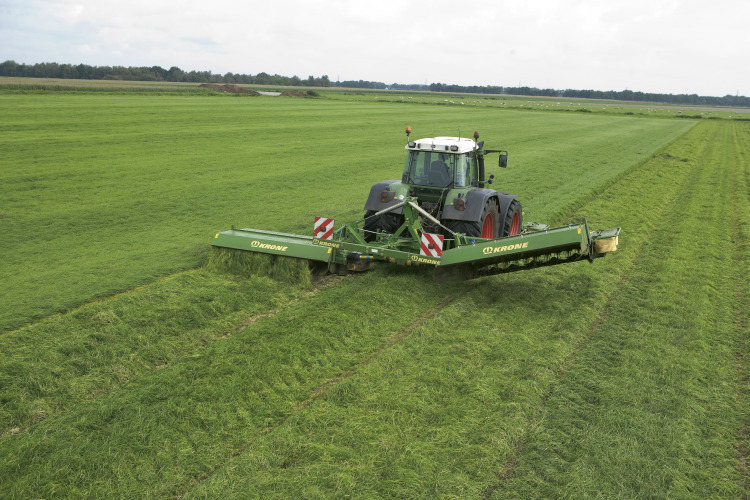 Krone mowers feature a large overlap between discs that turn away from each other, which results in stripeless cuts. 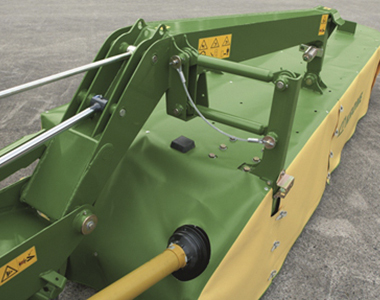 This system suspends the mower in it’s centre of gravity and guides it on two arms to maintain a uniform ground pressure across the entire working width. Uniform ground pressure means higher quality and consistent forage. 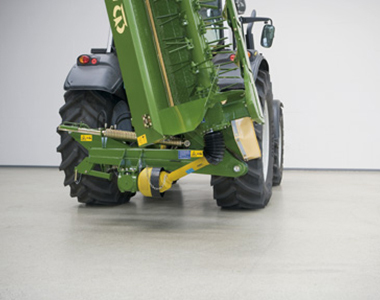 Mounted at a steep angle and constructed with hardened steel tine’s, Krone’s Flail conditioners produce a rigorous and uniform conditioning action across the entire work width. Ensure a strong grip on your crop! The 640mm massive rotor guarantees a smooth crop flow, high intake capacity and best conditioning. Individual belt lift/lower offers full flexibility, either both wings are spreading the material or one only or each wing is working to produce a single windrow. 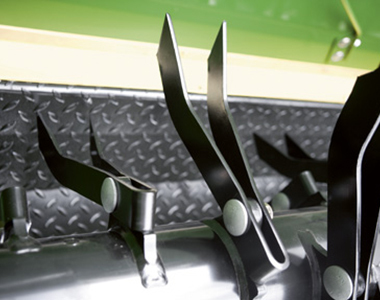 Electric height control of accelerator rollers and variable belt speeds provide for variable windrow widths. 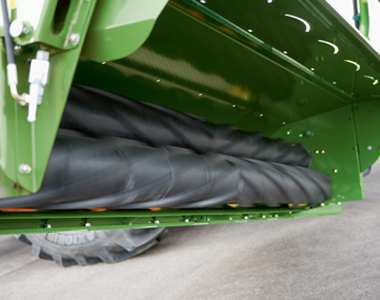 Wide cross belts ensure a continuous crop flow. Equipped with Steel rollers as standard for that perfect conditioning effect. Equipped with Polyuerethane rollers as standard for the gentlest of crop conditioning. Optional steel rollers are available for 3.2m mowers only. 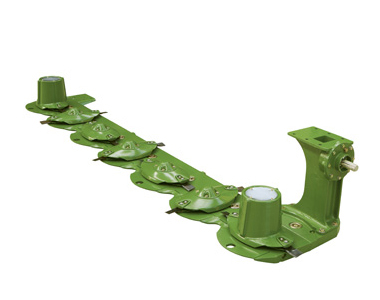 Standard with Top roller drives on all roller conditioner mowers ensures constant feeding through both drive rollers. The biggest contact area between the rollers due to the large 250mm daimeter rollers ensuring optimal conditioning. 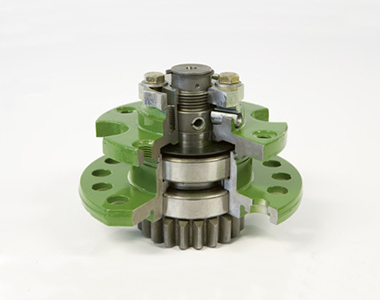 When the disc hits an obstacle, the shear pin breaks and the disc threads up on the threaded drive shaft and moves out of the way of it’s neighbouring discs, which continue to spin without damage. The mower bed swings to the rear and up, away from any obstacle. Matching this design with the ultra strong fully welded cutterbar provides a system built tough for Australian conditions. 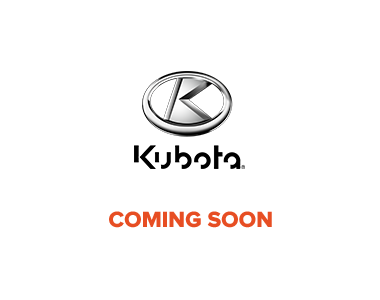 All krone mowers a built to stand the test of time, with only the highest quality components used you can be sure that your Krone mower is built to last. Compact, balanced and mid-mount transport positions means excellent weight distribution and visibility.